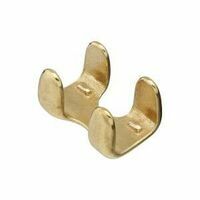 National Hardware Rope Clamp, Non-Magnetic, Series: 3235BC, 150 lb Working Load, 7/16 - 1/2 in, Solid Brass, Solid Brass, For Marine and Other Outdoor Applications Refill grommets used to repair canvas, tarpaulins, tents, awnings, sailcloth, lawn furniture, pool covers, etc. Refill grommets used to repair canvas, tarpaulins, tents, awnings, sailcloth, lawn furniture, pool covers, etc. Refill grommets used to repair canvas, tarpaulins, tents, awnings, sailcloth, lawn furniture, pool covers, etc. Solid brass fasteners with nickel plating will not rust. Used to repair canvas, tarpaulins, tents, awnings, sailcloth, lawn furniture and pool covers. contains 6 snap fastener sets. Wellington Clothesline, Braided Multi-Purpose, Series: A5214H0050H10, 7/32 in Diameter, 50 ft Length, 12 lb, Cotton, Synthetic Core Solid brass fasteners with nickel plating will not rust. Used to repair canvas, tarpaulins, tents, awnings, sailcloth, lawn furniture and pool covers. Contains 6 screw snap fastener sets. Solid brass fasteners with nickel plating will not rust. Used to repair canvas, tarpaulins, tents, awnings, sailcloth, lawn furniture and pool covers. Kit Contains: 2-piece setting tool with knurled body for greater comfort and safety, and 6 fastener sets. Runs smoothly around pulleys, minimum stretch, water and mildew resistant. Solid brass fasteners with nickel plating will not rust. Kit Contains: 2-piece setting tool with knurled body for greater comfort and safety, and 6 fastener sets. Constructed from a specially formulated, high strength synthetic fiber. Bright white, 3/16" Nominal Diameter. Labeled and shrink-wrapped. White. Manufactured with a jacket of lockstitched cotton and synthetic yarns. Popular as a pulley line in large metropolitan cities. Easily tied and will withstand the wear and tear of being frequently put up and taken down. Diameter sized for secure clothespin gripping. 7/32" Nominal Diameter. Labeled and shrink-wrapped hank. Solid braid construction enables it to retain its firm, round shape under stress. Uses: Window sash cord, utility rope. 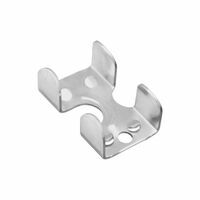 Designed for attaching Durock, Wonderboard or equivalent glass-mesh cement backerboard to wood or light gauge steel studs. Patented serrated head design countersinks for flush seating at any angle, providing a smooth surface for tile. Star drive recess with included T-25 bit provides for one-handed installation. Feature a Climacoat corrosion resistant finish that prevents rust from bleeding into grout. Perfect for use in high moisture areas such as baths, showers, countertops, and floors. Conforms to ANSI A108.11 for cement board attachment. Designed for attaching Durock, Wonderboard or equivalent glass-mesh cement backerboard to wood or light gauge steel studs. Patented serrated head design countersinks for flush seating at any angle, providing a smooth surface for tile. Star drive recess with included T-25 bit provides for one-handed installation. Feature a Climacoat corrosion resistant finish that prevents rust from bleeding into grout. Perfect for use in high moisture areas such as baths, showers, countertops, and floors. Conforms to ANSI A108.11 for cement board attachment. Ideal for tarpaulin, canvas, tents and covers. Repairs boat, camper, canvas, convertible, tarpaulin covers, trailer, clothing, curtains, sleeping bags, tents, etc. Kit Includes: brass grommets with hardened steel hole cutter; hardwood backer block; Hardened mandrel and anvil. Designed for attaching HardieBacker or equivalent fiber cement backerboard to wood or light gauge steel studs. Patented serrated head design countersinks for flush seating at any angle, providing a smooth surface for tile. Star drive recess with T-25 bit provides for one-handed installation. Climacoat corrosion resistant finish prevents rust from bleeding into grout and are perfect for use in high moisture areas. Conforms to ANSI A108.11 for cement board attachment. Repairs boat, camper, canvas, convertible, tarpaulin covers, trailer, clothing, curtains, sleeping bags, tents, etc. Kit Includes: brass grommets with hardened steel hole cutter; hardwood backer block; Hardened mandrel and anvil. Repairs boat, camper, canvas, convertible, tarpaulin covers, trailer, clothing, curtains, sleeping bags, tents, etc. Kit Includes: brass grommets with hardened steel hole cutter; hardwood backer block; Hardened mandrel and anvil. Use for attaching cement board to wood studs. Approx. 166 count per lb. Use for attaching cement board to wood studs. Approx. 166 count per lb. Designed for attaching HardieBacker or equivalent fiber cement backerboard to wood or light gauge steel studs. Backer-On's patented serrated head design countersinks for flush seating at any angle, providing a smooth surface for tile. Star drive recess with T-25 bit provides for one-handed installation. Climacoat corrosion resistant finish prevents rust from bleeding into grout and are perfect for use in high moisture areas. Conforms to ANSI A108.11 for cement board attachment. Self-sealing neoprene washer for waterproof applications. Premium finish provides exceptional corrosion resistance in harsh outdoor environments. For metal-to-metal (26-22 gauge) or metal-to-wood applications. Applications: Attaching roofing and wall panels to steel framing, roofing panels over insulation to wood structure, pole barn construction. Self-sealing neoprene washer for waterproof applications. Premium finish provides exceptional corrosion resistance in harsh outdoor environments. For metal-to-metal (26-22 gauge) or metal-to-wood applications. Applications: Attaching roofing and wall panels to steel framing, roofing panels over insulation to wood structure, pole barn construction. Used to repair canvas, tarpaulins, tents, awnings, sail cloth, lawn furniture and pool covers. Wood to metal screws are made from C1022 steel, case hardened for fastening wood to steel or aluminum. #10-24 screw is a Phillips wafer head. #12-24 (#14 Head) and #14-20 screws are star drive flat head. The star drive flat head reduces camout and end load, handles greater torque than Phillips or square drive, and eliminates spinning and fastener damage. For star drive use a T30 drill bit (not included). Reamer wings drill through wood and snap off when they encounter metal. The #3 drill point penetrates up to 1/4" metal with no predrilling. Shank slot holds steel shavings and improves drilling action. Ideal for trailer beds and walls. All screws are 1,000 hour salt spray test dacro coated. All Acorn International screws are packed 250 pieces in a heavy duty tear-off resealable bag, UPC coded and retail ready. All bag and carton labels are trilingual. Cartons are heavy duty cardboard of uniform size. Wellington Clothesline, Braided Multi-Purpose, Series: A5214Y0200H10, 7/32 in Diameter, 200 ft Length, 12 lb, Cotton, Synthetic Core, For Indoor and Outdoor Zinc finish. Light duty applications. Metal to metal screws are sealing self-drilling tapping screws made from C1022 steel, case hardened for roofing and siding applications. The screw drills its own hole, forms mating threads and makes a complete secure fastening in a single operation. Acorn International metal to metal screws have a #3 drill point for fastening sheets to purlins up to 1/4" total thickness with no predrilling. #12-14 screws are 5/16" across flats hex washer head and #14-14 screws are 3/8" across flats hex washer head with assembled EPDM washer for easy driving and conformance to the metal surface for a secure and long-lasting seal. All screws are 1,000 hour salt spray test dacro coated. Colored screws are powder coated over the dacro base coating. All Acorn International screws are packed 250 pieces in a heavy duty tear-off resealable bag, UPC coded and retail ready. All bag and carton labels are trilingual. Cartons are heavy duty cardboard of uniform size. Metal to metal screws are sealing self-drilling tapping screws made from C1022 steel, case hardened for roofing and siding applications. The screw drills its own hole, forms mating threads and makes a complete secure fastening in a single operation. Acorn International metal to metal screws have a #3 drill point for fastening sheets to purlins up to 1/4" total thickness with no predrilling. #12-14 screws are 5/16" across flats hex washer head and #14-14 screws are 3/8" across flats hex washer head with assembled EPDM washer for easy driving and conformance to the metal surface for a secure and long-lasting seal. All screws are 1,000 hour salt spray test dacro coated. Colored screws are powder coated over the dacro base coating. All Acorn International screws are packed 250 pieces in a heavy duty tear-off resealable bag, UPC coded and retail ready. All bag and carton labels are trilingual. Cartons are heavy duty cardboard of uniform size. Metal to metal sealing self-drilling tapping screws made from C1022 steel, case hardened for roofing and siding applications. The screws have a #3 drill point and are designed for 26 gauge and heavier metal to join laps and to stitch corner and rake trims and the ridge cap where they overlap wall steel. A 5/16" across flats high hat hex washer head with assembled EPDM washer offers easy driving and conforms to the metal surface for a secure and long-lasting seal. All screws are 1,000 hour salt spray test dacro coated. All Acorn International screws are packed 250 pieces in a heavy duty tear-off resealable bag, UPC coded and retail ready. All bag and carton labels are trilingual. Cartons are heavy duty cardboard of uniform size. For attaching wood to metal. Strong holding power. Features sharp points and can be used where a flush appearance is needed. Approved for teated lumber. Metal to metal screws are sealing self-drilling tapping screws made from C1022 steel, case hardened for roofing and siding applications. The screw drills its own hole, forms mating threads and makes a complete secure fastening in a single operation. Acorn International metal to metal screws have a #3 drill point for fastening sheets to purlins up to 1/4" total thickness with no predrilling. #12-14 screws are 5/16" across flats hex washer head and #14-14 screws are 3/8" across flats hex washer head with assembled EPDM washer for easy driving and conformance to the metal surface for a secure and long-lasting seal. All screws are 1,000 hour salt spray test dacro coated. Colored screws are powder coated over the dacro base coating. All Acorn International screws are packed 250 pieces in a heavy duty tear-off resealable bag, UPC coded and retail ready. All bag and carton labels are trilingual. Cartons are heavy duty cardboard of uniform size. 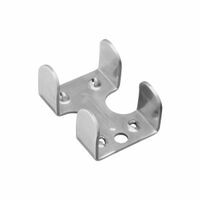 Designed for attaching Durock, Wonderboard or equivalent glass-mesh cement backerboard to wood or light gauge steel studs. Patented serrated head design countersinks for flush seating at any angle, providing a smooth surface for tile. Star drive recess with included T-25 bit provides for one-handed installation. Feature a Climacoat corrosion resistant finish that prevents rust from bleeding into grout. Perfect for use in high moisture areas such as baths, showers, countertops, and floors. Conforms to ANSI A108.11 for cement board attachment. Wood to metal screws are made from C1022 steel, case hardened for fastening wood to steel or aluminum. #10-24 screw is a Phillips wafer head. #12-24 (#14 Head) and #14-20 screws are star drive flat head. The star drive flat head reduces camout and end load, handles greater torque than Phillips or square drive, and eliminates spinning and fastener damage. For star drive use a T30 drill bit (not included). Reamer wings drill through wood and snap off when they encounter metal. The #3 drill point penetrates up to 1/4" metal with no predrilling. Shank slot holds steel shavings and improves drilling action. Ideal for trailer beds and walls. All screws are 1,000 hour salt spray test dacro coated. All Acorn International screws are packed 250 pieces in a heavy duty tear-off resealable bag, UPC coded and retail ready. All bag and carton labels are trilingual. Cartons are heavy duty cardboard of uniform size. Provides secure, weather-sealing metal-to-metal fastening with strong holding power without the need to pre-drill. Engineered drill-point and flute remove material efficiently and properly size the hole for threads. Ideal for fastening thicker gauge (20-12-Gauge) exterior metal to metal where a sealing washer is needed. Provides secure, weather-sealing metal-to-metal fastening with strong holding power without the need to pre-drill. Engineered drill-point and flute remove material efficiently and properly size the hole for threads. Ideal for fastening thicker gauge (20-12-Gauge) exterior metal to metal where a sealing washer is needed. Premium polished cotton clothesline. Constructed like a light-weight sash cord and polished for greater abrasion resistance. Designed for attaching HardieBacker or equivalent fiber cement backerboard to wood or light gauge steel studs. Patented serrated head design countersinks for flush seating at any angle, providing a smooth surface for tile. Star drive recess with T-25 bit provides for one-handed installation. Climacoat corrosion resistant finish prevents rust from bleeding into grout and are perfect for use in high moisture areas. Conforms to ANSI A108.11 for cement board attachment. 50 screws per flat strip. Coarse 2/3 thread with wax. Yellow zinc finish. Compatible with DS440AC (557.4876), DS425AC (557.4827), DS332AC (264.0720), DS232AC (264.0670) and DS31218V (305.6512). Designed for attaching HardieBacker or equivalent fiber cement backerboard to wood or light gauge steel studs. Patented serrated head design countersinks for flush seating at any angle, providing a smooth surface for tile. Star drive recess with T-25 bit provides for one-handed installation. Climacoat corrosion resistant finish prevents rust from bleeding into grout and are perfect for use in high moisture areas. Conforms to ANSI A108.11 for cement board attachment. 50 screws per flat strip. Coarse 2/3 thread with wax. Yellow zinc finish. Compatible with DS440AC (557.4876), DS425AC (557.4827), DS332AC (264.0720), DS232AC (264.0670) and DS31218V (305.6512). Metal to metal screws are sealing self-drilling tapping screws made from C1022 steel, case hardened for roofing and siding applications. The screw drills its own hole, forms mating threads and makes a complete secure fastening in a single operation. Acorn International metal to metal screws have a #3 drill point for fastening sheets to purlins up to 1/4" total thickness with no predrilling. #12-14 screws are 5/16" across flats hex washer head and #14-14 screws are 3/8" across flats hex washer head with assembled EPDM washer for easy driving and conformance to the metal surface for a secure and long-lasting seal. All screws are 1,000 hour salt spray test dacro coated. Colored screws are powder coated over the dacro base coating. All Acorn International screws are packed 250 pieces in a heavy duty tear-off resealable bag, UPC coded and retail ready. All bag and carton labels are trilingual. Cartons are heavy duty cardboard of uniform size. Use for attaching cement board to wood studs. Approx. 166 count per lb. Use for attaching cement board to wood studs. Approx. 166 count per lb. Provides secure, weather-sealing metal-to-metal fastening with strong holding power without the need to pre-drill. Engineered drill-point and flute remove material efficiently and properly size the hole for threads. Ideal for fastening thicker gauge (20-12-Gauge) exterior metal to metal where a sealing washer is needed. Provides secure, weather-sealing metal-to-metal fastening with strong holding power without the need to pre-drill. Engineered drill-point and flute remove material efficiently and properly size the hole for threads. Ideal for fastening thicker gauge (20-12-Gauge) exterior metal to metal where a sealing washer is needed. For attaching wood to metal. Strong holding power. Features sharp points and can be used where a flush appearance is needed. Approved for teated lumber. Wood to metal screws are made from C1022 steel, case hardened for fastening wood to steel or aluminum. #10-24 screw is a Phillips wafer head. #12-24 (#14 Head) and #14-20 screws are star drive flat head. The star drive flat head reduces camout and end load, handles greater torque than Phillips or square drive, and eliminates spinning and fastener damage. For star drive use a T30 drill bit (not included). Reamer wings drill through wood and snap off when they encounter metal. The #3 drill point penetrates up to 1/4" metal with no predrilling. Shank slot holds steel shavings and improves drilling action. Ideal for trailer beds and walls. All screws are 1,000 hour salt spray test dacro coated. All Acorn International screws are packed 250 pieces in a heavy duty tear-off resealable bag, UPC coded and retail ready. All bag and carton labels are trilingual. Cartons are heavy duty cardboard of uniform size. Provides secure, weather-sealing metal-to-metal fastening with strong holding power without the need to pre-drill. Engineered drill-point and flute remove material efficiently and properly size the hole for threads. Ideal for fastening thicker gauge (20-12-Gauge) exterior metal to metal where a sealing washer is needed. Convenient plastic collated strips hold 30 screws. Wood screw, twin thread, 2/3 rolled, sharp point, flat head w/nibs for interior subfloors. Requires #3 square drive. Fast pitch screw is twin thread; drives faster than a single tread screw. Wood to metal screws are made from C1022 steel, case hardened for fastening wood to steel or aluminum. #10-24 screw is a Phillips wafer head. #12-24 (#14 Head) and #14-20 screws are star drive flat head. The star drive flat head reduces camout and end load, handles greater torque than Phillips or square drive, and eliminates spinning and fastener damage. For star drive use a T30 drill bit (not included). Reamer wings drill through wood and snap off when they encounter metal. The #3 drill point penetrates up to 1/4" metal with no predrilling. Shank slot holds steel shavings and improves drilling action. Ideal for trailer beds and walls. All screws are 1,000 hour salt spray test dacro coated. All Acorn International screws are packed 250 pieces in a heavy duty tear-off resealable bag, UPC coded and retail ready. All bag and carton labels are trilingual. Cartons are heavy duty cardboard of uniform size. 9'10" lift height, 12.5" required head room, 1/4" grade 80 steel chain, fully portable for use indoors or out, forged 360 degree swivel hooks, mechanical load brake, hardened steel construction. 1/4" grade 80 steel chain, forged 360 degree hooks, mechanical load brake for positive load control when lifting or spotting, hardened steel construction, 14" required head room, fully portable for outdoor or indoor use. Lift height: 9'10", Convenient plastic collated strips hold 30 screws. Wood screw, twin thread, 2/3 rolled, sharp point, flat head w/nibs for interior subfloors. Requires #3 square drive. Fast pitch screw is twin thread; drives faster than a single tread screw. Convenient plastic collated strips hold 30 screws. Wood screw, twin thread, 2/3 rolled, sharp point, flat head w/nibs for interior subfloors. Requires #3 square drive. Fast pitch screw is twin thread; drives faster than a single tread screw. Pull triple geared chain block hoist is ideal for automotive, industrial and individual farm and marine use. Thick heat-treated steel construction prevents damage from extra rough handling. Interchangeable parts keep maintenance costs at a minimum. Pull triple geared chain block hoist is ideal for automotive, industrial and individual farm and marine use. Thick heat-treated steel construction prevents damage from extra rough handling. Interchangeable parts keep maintenance costs at a minimum. Chain Pullers pull, lift, and drag with ease and speed. Specifications: Rated Capacity: 3/4-ton Tested Load: 1-1/8-ton Standard Lift: 5 feet Chain diameter: 1/4" Handle length: 11-3/16" Net weight: 17.7 lbs Chain Pullers pull, lift, and drag with ease and speed. 5 Foot Lift. Specifications: Rated Capacity: 1-1/2-ton Tested Load: 2-1/4-ton Standard Lift: 5 feet Chain diameter: 5/16" Handle length: 16-3/8" Net weight: 26.5 lbs Triple geared block chain hoist; portable and designed to operate under rugged conditions. Thick, specially heat-treated steel construction prevents damage from extra rough handling. Interchangeable parts keep maintenance costs at a minimum. Specifications: Rated Capacity - 2 Ton, Test Load - 3 Ton, Standard Lift - 10', Chain Diameter - 5-16". Applications: Ideal for automotive, industrial and individual farm and marine use.